Speaking With Insurance Adjusters After a Personal Injury | Hupy and Abraham, S.C.
How should I deal with an insurance adjuster after a personal injury? 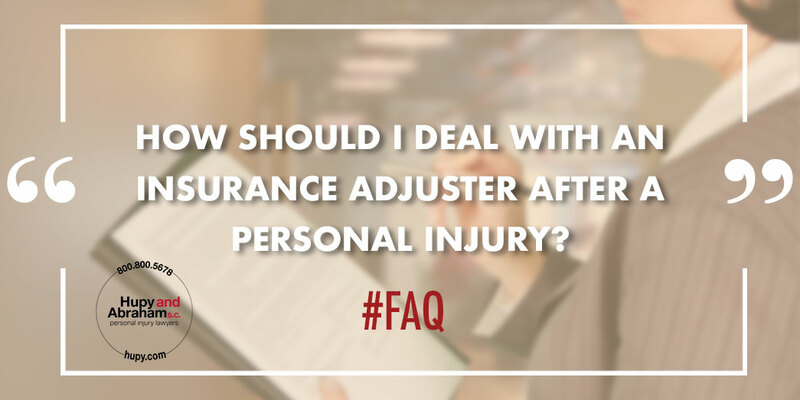 If you’ve been hurt in any kind of personal injury accident, then it is important to deal with the insurance adjuster cautiously and with a complete understanding of his job. Additionally, it is important to know that you always have the right to contact a personal injury lawyer and to have your lawyer deal with the insurance adjuster on your behalf. You may put your fair recovery at risk if you say too much or if you say something that is misconstrued by the insurance adjuster. Don’t risk making a mistake that could have been easily avoided. Instead, learn how to protect your rights after someone else has hurt you. It is the insurance adjuster’s job to get you to accept as little as possible for your injuries even if the insured is legally responsible for your injuries. Insurance companies maximize their profits by paying out as little as possible in settlements, and insurance adjusters are looking out for their employers. To that end, insurance adjusters may try to use anything that you say against you. They may try to make it seem like they are looking out for your best interests, but their loyalty is to the insurance companies that employ them. Accordingly, if you must speak with an insurance adjuster, then it is important to stick to the facts such as the date the accident occurred, where it occurred, and who was involved in the crash. Any further discussions should be directed to your personal injury lawyer. Experienced personal injury lawyers know what information to provide to insurance adjusters and just as importantly how and when to provide it. An attorney can make sure that your rights are protected. He can explain how a personal injury lawsuit works and can advocate for your full and fair recovery. Once the insurance company is notified that you are represented by counsel then you should no longer have direct contact with the insurance adjusters. That stress—the worry of always having to watch what you say—should be removed from your shoulders while your attorney works hard to get you the settlement that you deserve. If you would like to speak with a personal injury lawyer about your claim and about how to protect it, please reach out to us via this website or by phone at any time. We are here to help you.